Rick White is a UHD alum and an author and he'll be returning to UHD Dec. 11 for a book signing. 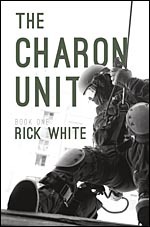 White will be available in the UHD Bookstore to sign copies of his crime novel, "The Charon Unit: Slicing the Pie, Chicago Style" from 11 a.m. - 2 p.m. Dec. 11. Stop by, get your own copy of this awesome book, the second of a trilogy, and have it signed by the author! White is an expert on gangs and has been a presenter at the Texas Gang Investigators Association conference for several years.